Drs WD Dar and RS Paroda addressing the participants of the training program. Further steps must be taken towards implementing appropriate biosafety and food quality standards by enhancing the technical skills of laboratory personnel from the developing countries of Asia and Africa. The ultimate goal is to ensure Inclusive Market-Oriented Development (IMOD) by leveraging on the potential of the agribusiness and food processing sectors in Asia and Africa, ICRISAT Director General Dr William D Dar said. Dr Dar was speaking at the training program on “Analytical Techniques in Nutrition, Food Safety and Biosafety” organized by ICRISAT in association with the Asia-Pacific Association of Agricultural Research Institutes (APAARI). The Director General, in his address, highlighted that such capacity building activities are part of ICRISAT’s efforts to help develop mechanisms to link the smallholder farmers to markets, and make them resilient and sustainable in the long run. During the two-week training program, the participants were provided hands-on training in understanding Genetically Engineered Food safety assessment; risk analysis for genetically modified organisms (GMOs) – concepts, methods, and issues; use of GMOs under containment, confined, and limited field trials; post-release monitoring of GMOs; and allergenicity and toxicity assessment in GM crops. The participants were also exposed to nutritional analysis, sessions on laboratory accreditation (ISO/IEC 17025:2005), rules and regulations in the food industry and their implications on international trade. Hands-on training on different analytical aspects of food testing was arranged at the National Collateral Management Services Ltd (NCML), Hyderabad. Addressing the participants, Dr RS Paroda, Executive Secretary, APAARI, stressed on the importance of establishing accredited laboratories, especially in the public sector, and their need in the current global scenario. 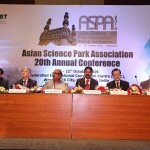 Dr JL Karihaloo, Coordinator, Biotechnology Program (APCoAB), APAARI also spoke on APAARI’s activities in biosafety, with special emphasis on the role of GMOs in addressing food and nutritional security. 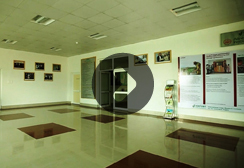 Dr Kiran Sharma, Director – Platform for Translational Research on Transgenic Crops (PTTC) said, “Food safety starts from post-harvest handling through storage, processing, distribution and consumption. Appropriate interventions across the food value chain can prevent contamination and outbreak of food-borne diseases. 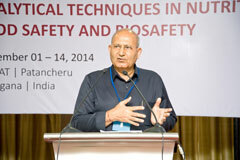 Nutritional security is not possible without food safety and biosafety,” he emphasized. 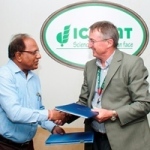 The training program was supported by the Research Programs on Dryland Cereals and Grain Legumes and was coordinated by PTTC and the NutriPlus Knowledge Program of the ICRISAT Agribusiness Innovation Platform. Eighteen participants from Nepal, Bangladesh, Taiwan, Thailand, Syria, Philippines, Sri Lanka, Vietnam, Zambia, Ghana, Kenya, and Zimbabwe attended the training at the ICRISAT headquarters.